Grace Coddington, as I wrote a couple of months ago in a post entitled, Uniquely Finesse, Coddington’s Dream, is a remarkable talent, an enchanting romantic, a creative soul, a wonderful dreamer, and a fierce creative director. She is a woman who has the power and determination to emphasize, to emphasize the true powers of fashion, thought, art, photography, and meaning. She is a woman who has the dazzling ability to create a new world, a new world full of dramatic styles, fluid movements, and thoughtful imaginations. 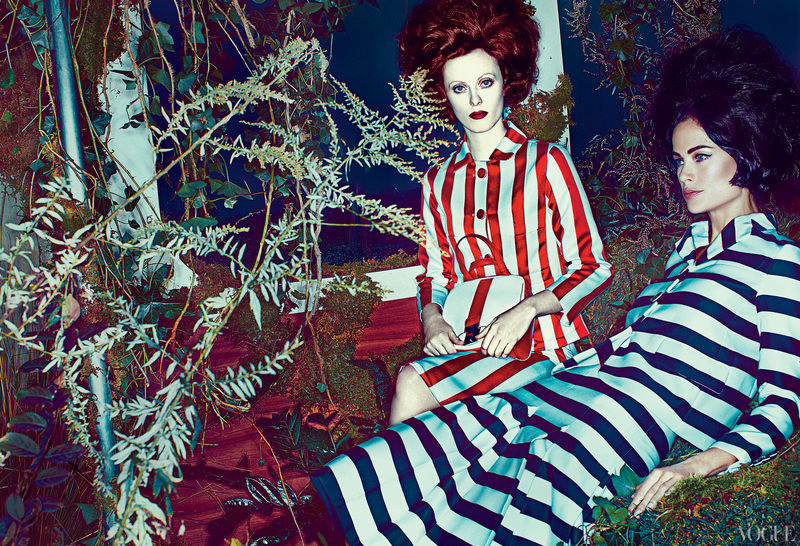 Grace Coddington sees fashion as something truly magical. She sees it as a universe of mystical delicacies where present and past, simple and complex unite; a world of manifestations, where cultured intellect, diverse achievement, and creative mind are empowered. Coddington is a strong influence in the fashion industry. Her wonderful messages are always heard, connecting passionately with the viewer. Her wonderful magic is felt in whatever she creates, holding a magnificent depth and capturing a dreamy spell. And this magic is felt so wonderfully in the January issue of Vogue, in a photo shoot that is both rhythmically and enchantingly inviting. In a garden of minimalistic delights, personal mysteries and heated intrigues; in a garden of revealed truths and modern ways of dress, thought and desire; in a garden of felt powers and unafraid stances of confidence and secrecy, there are unmistakable eerie qualities, alluring revelations of botanical beauties and modern fashions. There are seemingly painted flowers, with fine-detailed colors accentuated with distinction, colors of a mesmerizing beauty, a third dimension. In this garden, courageousness comes to life, as the flowers bloom and the secrets thrive. In this garden, fashions breathe with feeling, thought, freedom, and life, as the silks shine and the furs plush. In this garden, Coddington creates a new, unforgettable world where fashion soars and takes the reigns. The fashions tell the story. 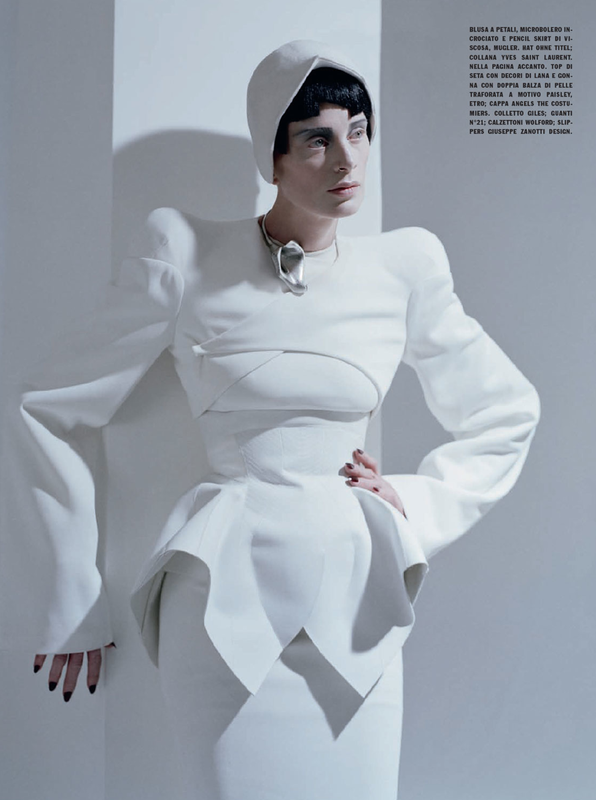 With Spring’s beliefs of modernism and minimalism at hand, Coddington styles outfits of creative simplicity, architectural structure, and futuristic pleasure. She styles fashions of bold, pop-art flavor, retro stripe and circle, modern elegancy, seductive cut-out, silk, and sheer, and abstract, techno randomness. Showing the wonderful creations of designers such as Marc Jacobs, Miu Miu, Prada, Burberry Prorsum, Givenchy, Rochas, and Marni, Coddington shows the world the modern, 21st woman, the woman of intense growth and determination, the woman of innovative belief and praise, the woman of both classic elegance and lively wildness and thrill. Coddington reveals the woman of productivity, the woman who takes risks and dares to be loud. Coddington depicts the woman in the garden who takes her own path, willing to overcome obstacles and make proud statements. A movement to more bold decision and to more wearable unpredictability. The color wheel is full of endless possibilities. From rich, royal blues to sunny, bright yellows, from powerful, stand-out reds to romantic, light pinks–the colors are eternal. Color has this undeniable way of changing a person’s physical and internal appearance. It appears both warm and cold, bright and dull, frail and strong. It conveys raw emotions of lust and anger, as well as timidity and sadness. Color can never disappear–it can never leave the world. It can only strengthen its immense importance. 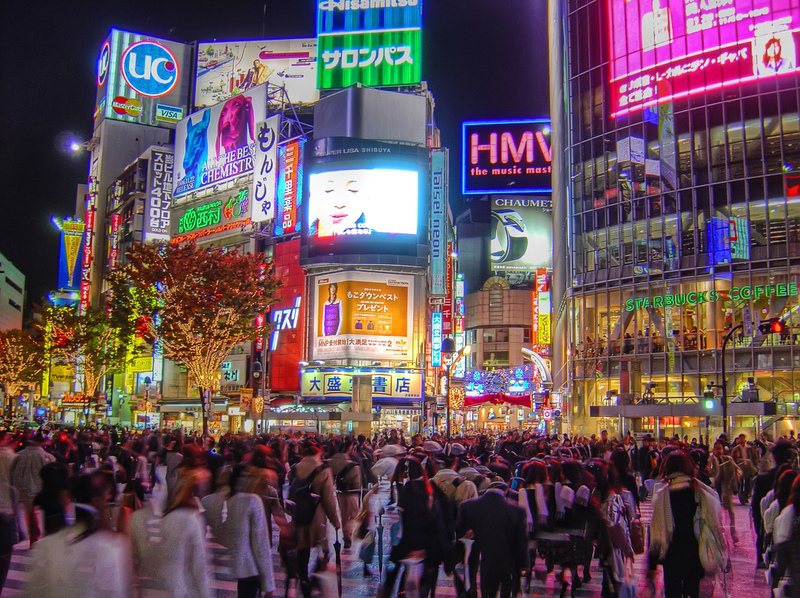 The impact and effect color has on our lives is impossible to ignore. Color enters your body, mind, and soul. It satisfies you with its attraction and fulfillment. It energizes you with individuality and imagination. Color helps to define who we are as human-beings. This past June, I wrote a post entitled, Into the Depths of Black and White. This post delved deep into the powers of black and white photography and explored the beauties it revealed and the emotions it expressed. In this post, evidently, two main colors were defined. These colors were black and white… two opposite colors that come together to form something magical. And they have a united, symmetrical sovereignty of worthy charm and grace when they come together. 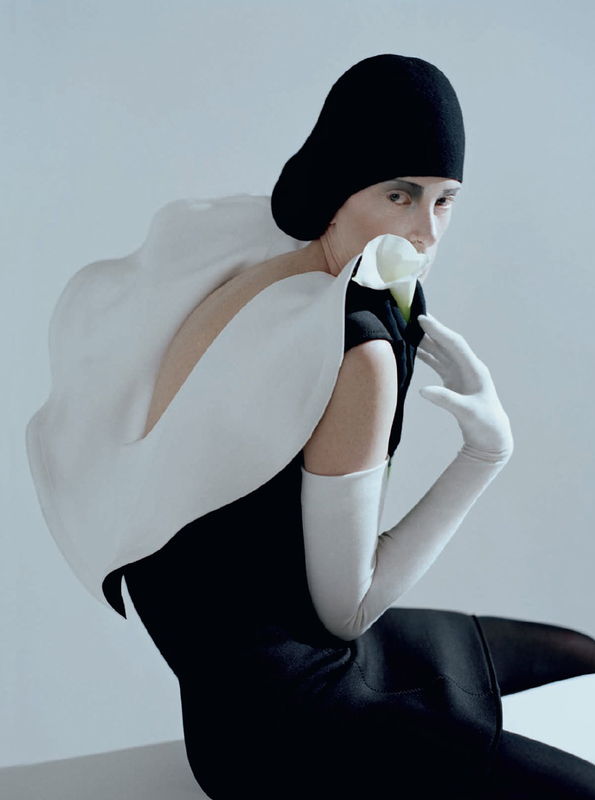 This is proven wonderfully in a photo shoot for Vogue Italia, entitled, Black & Roses, photographed by the talented Tim Walker. Black, a color that is associated with power, authority and seriousness. A color that is associated with mystery, ambiguity, and evil, with elegance, prestigiousness, and timelessness, with anguish, depression, and pain. It is a color with a lacy seductiveness and an edgy, secretive appeal. The color has a depth of emotion and substance. It has much meaning, much dominance and individuality. The color black is a true enigma, as well as a true staple in one’s life inside and outside of fashion. As depicted in the Black & Roses photo shoot, the color of black can be both submissive and outspoken. It can be both hidden and revealing. Without emotional lightness and colorful brightness, there is a deep truth and understanding to the color hue. Black makes an impression, a statement that will never be forgotten. White, a color that is associated with innocence, purity, and virginity, with safety, faith, and lightness. It is the color of the cool, winter snow, the angels of heaven. The color white floats with a beautifying airy quality. It soars with a romantic heart of pure love and devotion. White expresses happiness, inner delight, and light tenderness. 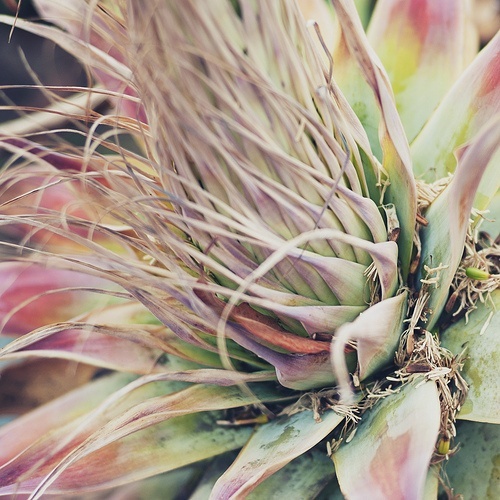 It is a color that is bold in its quietness and graceful in its simplicity. As shown in the Black & Roses photo shoot, white is something almost mystical, spiritual in its sheer accents and light drapings. White giggles in its playful exuberance and ethereal grace. Black and White, a powerful color combination that is beautiful in its classic, flawless appeal. By traveling to both sides of the color spectrum, a remarkable blending of dark and light is achieved. A piece of worth is created; a timeless fashion is embraced; a sleek design is produced. The colors carry with them an effortless elegance, a powerful stance, an everlasting brilliance. Obscurity is illuminated and clarity is concealed. Cryptic riddle is replaced by clarity. Clear distinction is replaced by dusk. An equal balance of worth and beauty. A contrasting bliss. A connection of greatness. Black and White. Color allows fashion to be what it wishes to be. Why walk straight forward through a door when you could easily walk sideways? 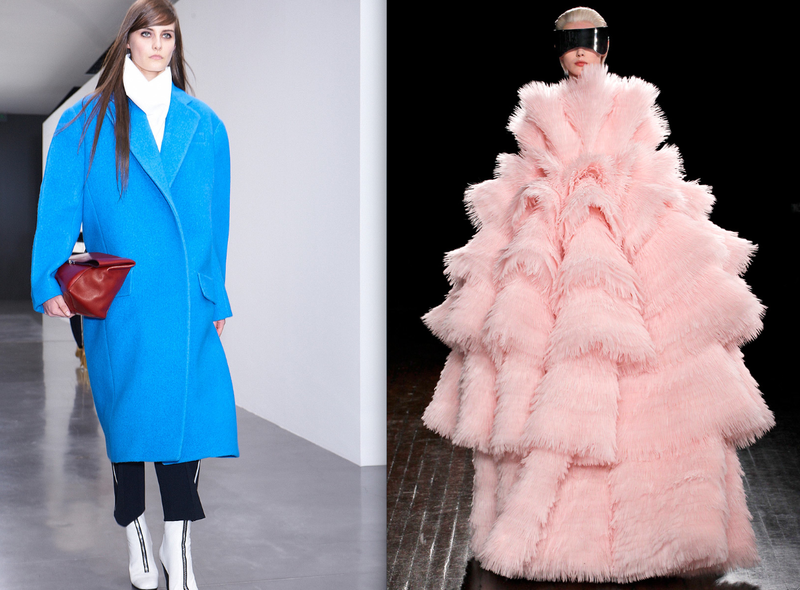 A new, creative, humorous shape is rocking the runways for this upcoming Fall. This look is fantastically zany, daringly wild, pleasingly funny, and crazily bold!–it is absolutely silly in its wacky, yet charming appeal. This look is going beyond the realm of normal wear and is entering into a whole new dimension of lighthearted design and entertaining concept. It is pushing away dull, monotone trends, and bringing forward original, current designs. It is staking its powerful claim in the fashion world. This new look is simply called the oversized proportion. But trust me, this kooky trend is far from simple! This fresh look for fall is full of extreme optimism and eye-catching appeal. Rather than being typical mainstream, it contains loud, unique elements that are large, wide, and long! It has energetic volume and shameless attitude. Rather than uncomfortable tightness, it embraces loose stretchiness and free, uplifting comfort. With comical dimensions, playful intensities, and pinnacle heights of substance and eccentricity, this look is enjoyably witty and dramatically ready for fall. The sensationally theatric, electrifyingly impressive, oversized look appears in many different ways. It could be a tall, lengthy coat, or an extravagantly ruffled, feminine, artistic gown. It could be an enigmatic, wide dress, or a modern tweed suit with an of whack twist. The look enters the sphere of the abstract. It takes the journey to the future. It enters the classic cosmos. It beautifies in the nature of simplicity. It envelops the chimerical, heavenly enchanting, romantic universe. The hugely genius, out of proportion design is delighting to the touch, with visionary, dreamy textures such as fuzzy felts, ruffled lace, and rough wool. The look is of unbalanced beauty! With purposeful, unsized proportions and creative shapes, the oversized look relishes and prospers in its passionate, exploratory design and structure. It recognizes and discovers exciting adventure, thrilling risk, artistic value, and joyous, fashionable laughter. Rationality is no longer necessary. Irrationality is a must! It is time to be uncommon! 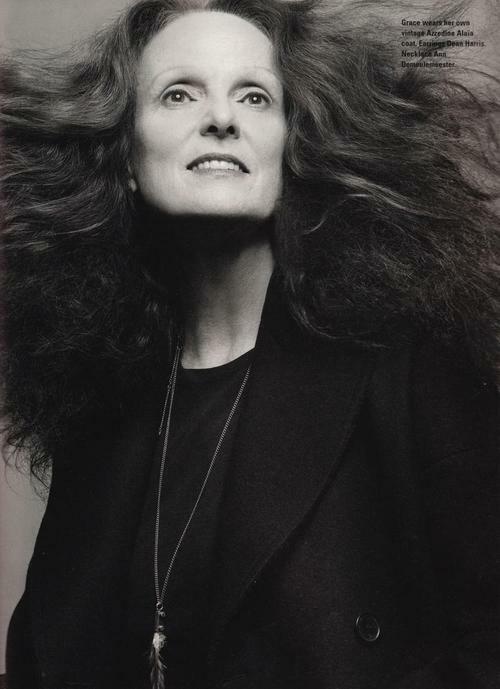 Fearless, transcendent, original, innovative–all of these are words to describe the incredible, talented, rare Grace Coddington. 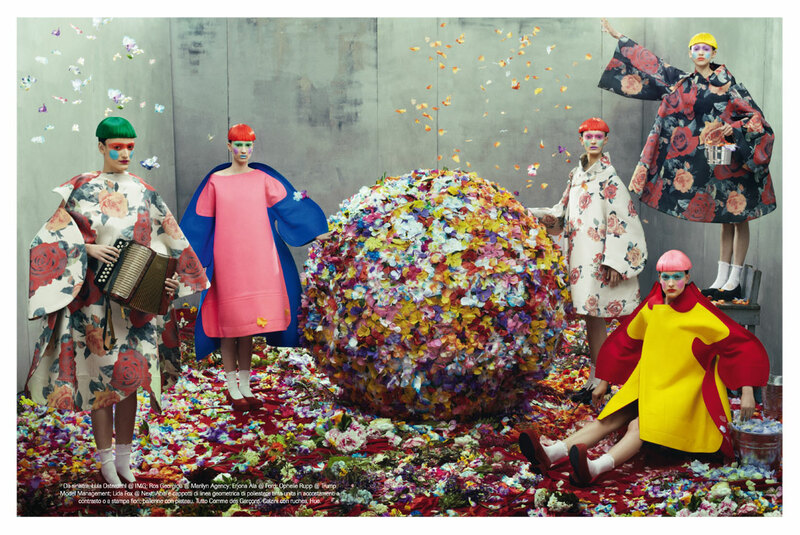 Setting the tone for Vogue’s creative philosophy, Grace Coddginton is a true visionary in the fashion world. 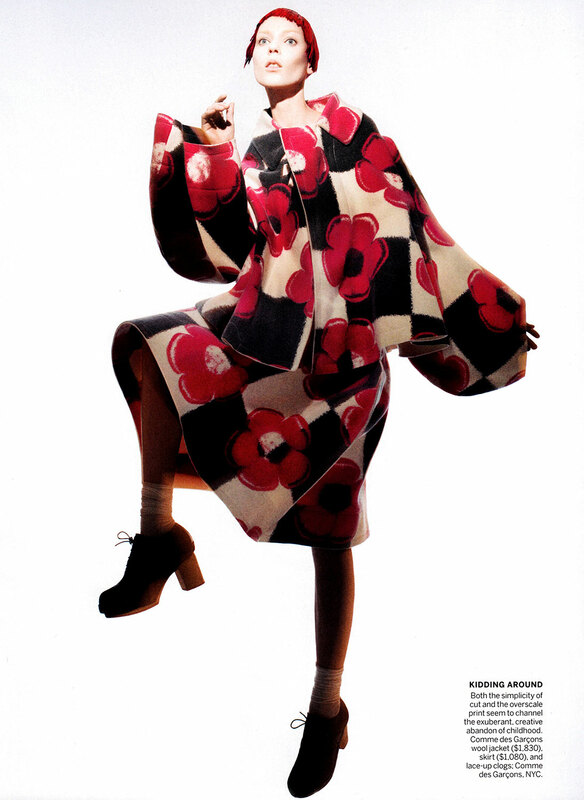 Joining American Vogue in 1988 and becoming the creative director, Coddington takes her experienced skill and translates it into photo shoots of imagination and reality. Taking daring risks, Coddington strives to create outfits that are memorably unique and effectively stunning. Whether it is a shot of contemporary fashion in a modern setting or a scene taking the viewer back in time to the thrilling 1920s, Coddington personalizes the shot to her gifted view and inspired style. 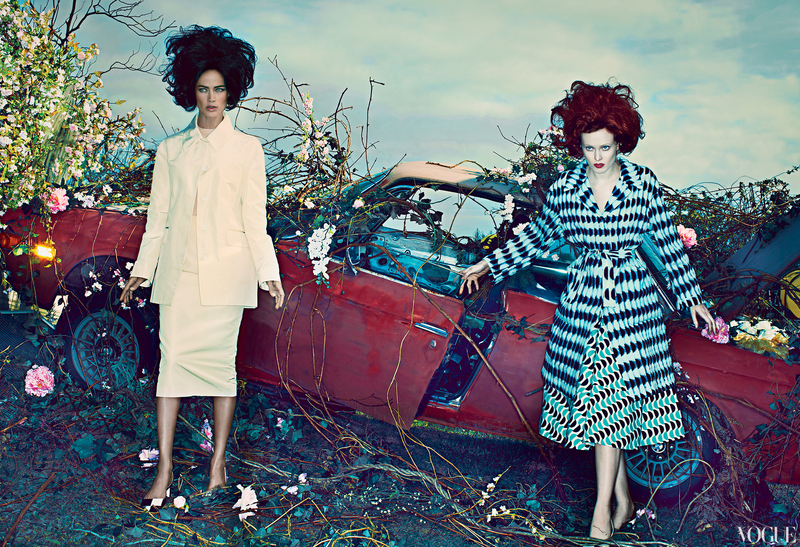 Grace Coddington does not let critical opinion’s influence her work. She has a keen-eye for style. She has a keen-eye for risk. She creates a thought-provoking fashion spectacle in her works. Illustrating a scene with an artist’s mind, Coddington leaves an inventive impression–a scene filled with emotion, color, and originality. Harmoniously refined, aesthetically pleasing, poetically seen- Coddington is remarkable. There is one Coddington shoot that effects me in way that is different from all the others. This shoot is the twenties story. 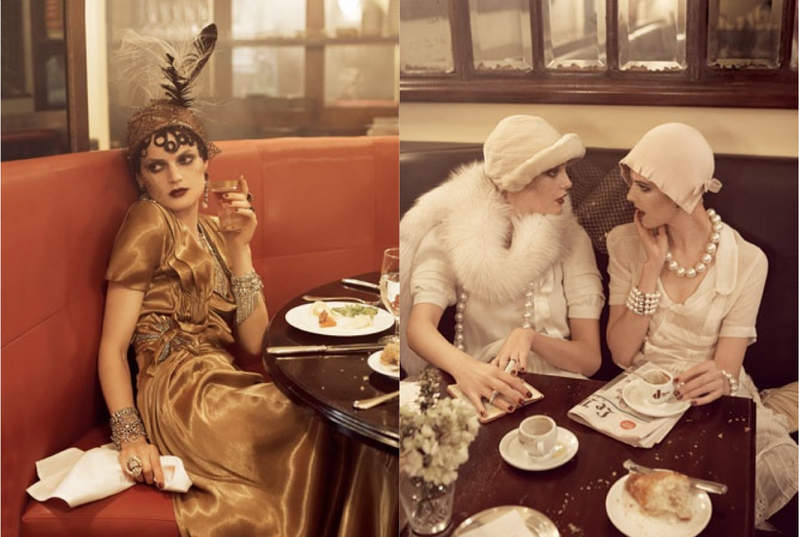 This historical shoot portraying scenes of the 1920s is beautiful, stylish, and rhythmically elegant. It sets a warm mood filled with a silent film movie allure. The flapper fashions are impeccable with luxurious pearls, cloche hats, feather boas, and sequined dresses. The make up is sultry with dark red lips and thick eye shadow. The jewelry is stunning with bright colors of blue and red to dark colors of black and charcoal. The setting is not too dramatic. The lighting is not too bright. The photo shoot is immaculate. Perfecting photography, relishing in picturesque outfits, I am in love. 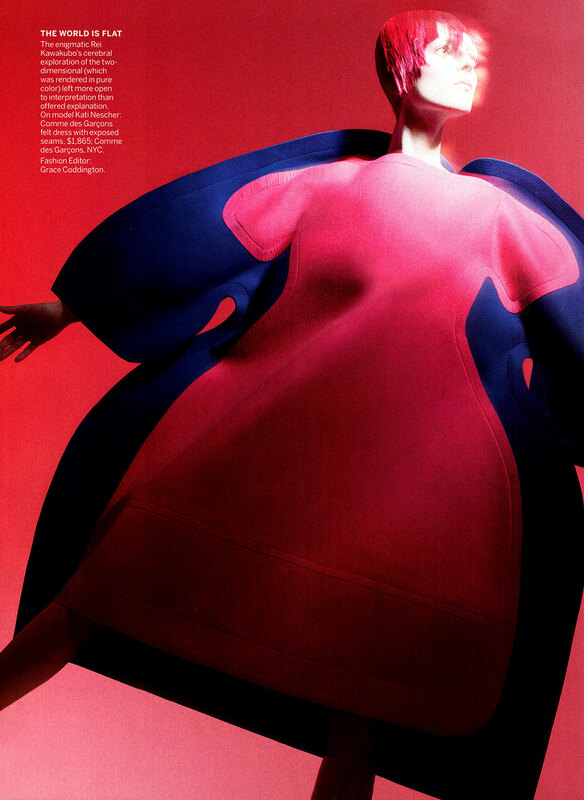 With a clever, honest, imaginative mind, Grace Coddington is truly gifted. Her power to create pictures and explore special ideas is remarkable. She is extravagantly cultured and fancifully talented. With personality she succeeds, with fashion she soars.